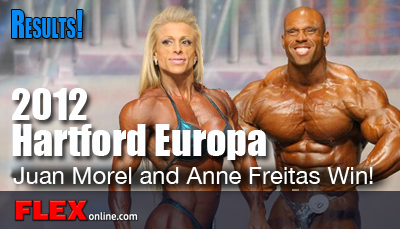 IFBB Professional Bodybuilders Juan Morel and Anne Freitas won their classes at the 2012 Hartford Europa Battle of Champions. IFBB Professional Bodybuilders Juan Morel and Anne Freitas won their classes at the 2012 Hartford Europa Battle of Champions. Juan Morel's pro debut was but a few months ago in the 2012 New York Pro, where he placed a respectable fourth. Not happy with his placing, Morel went home with only one goal in mind: Redemption. Well, he did it. Lifting heavy and hard, keeping his strict diet, Morel stepped on stage noticeably more conditioned than just a few months before. This is the look that won him his pro card and the look Juan needed to emulate tonight. Essa Obiad displayed some freaky quads and conditioning, but it wasn't enough to get him more than 3rd place and it allowed Mohamad Bannout to step comfortably into second place. In what has been his best showing yet, Bannout moved up from 11th place last year to 2nd, based on his added size, conditioning and most importantly clean lines. I'm really happy to see Amber DeFrancesco compete again. I was there when she won her class and overall at the 2010 Nationals. 6th place for her pro debut is not bad, but had she come in with the same look as at the 2010 Nationals, there is no doubt in my mind she would have placed higher. Monique Jones is moving up the ranks. Of all competitors on stage tonight, Monique out of all of them has the best Olympia potential, as a Lenda Murray clone. Mark my words: She will be there. Congratulations to Anne Freitas. Frietas dominated with muscle, conditioning and lines that accentuated a small waist and a wide back. Flawless color and an awesome tattoo that complimented her outfit carried her to the front of the pack for the overall win. I'd be remiss to not mention IFBB Pro Tazzie Columb. A veteran from the days of Kim Chizevsky and Lenda Murray, Tazzie displayed a much less muscular physique from years past but still carried those classic shoulders. Slightly older, Tazzie carried a package debatably capable of breaking the top 3 but was rewarded 4th. Juan Morel Wins Europa Hartford" src="